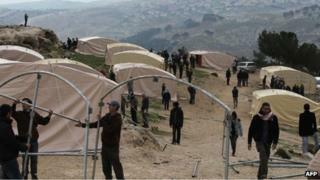 Palestinians in the West Bank have pitched a protest camp where Israel plans to build new settlement homes. Activists erected about 20 large tents on the patch of land known as E1, between Jerusalem and the Jewish settlement of Maale Adumim. Israeli plans to build in the area drew sharp criticism by members of the international community in December. Palestinians say that building in E1 would jeopardise the contiguity of a Palestinian state. Jewish settlements in the West Bank are considered illegal under international law, though Israel disputes this. "We have set up 20 tents, and have enough equipment to stay here for a long time," Abir Kopty, spokeswoman for the Popular Struggle Co-ordination Committee, told AFP news agency. "We are willing to stay here until we ensure the right of the [Palestinian] owners of the land to build on their lands," she said. Hours after the group started setting up the camp, Israeli authorities issued an eviction order. However, Ms Kopty tweeted that the activists had obtained a High Court order suspending the eviction notice. Israeli plans to develop the E1 area had been on hold for years until the Palestinians upgraded their status at the UN from an "entity" to that of a "non-member observer state", a move condemned by Israel and the US as a violation of peace accords. The following day Israel approved "preliminary zoning and planning work" in E1, and plans for thousands of settler homes. The US called this move counterproductive, while European governments summoned Israeli ambassadors in protest. Friday's actions of the Palestinians in E1 mirrors tactics of Israeli settlers who stake their claim to parts of the West Bank by pitching mobile homes on hilltops, known as outposts, which are not officially sanctioned. An unnamed spokesperson for the Israeli defence ministry said the creation of the Palestinian encampment, which they named Bab el Shams, "sounded like a provocation", AFP reported. "If it indeed is a construction violation, we will deal with it," he said.